PV Plant Selection — EcoTech Services, Inc.
EcoTech has partnered with a local nursery to be the supplier for the Plant Voucher Program. This nursery was selected for its wide selection of water efficient plant materials, it is centrally located within Upper District’s territory, and it is open to the public (retail). These plants have been approved for the Program. Plant Selection is subject to change without notice as nursery stock varies. Gray-green leaves with long-lasting yellow flowers. Spreading, mat-forming perennial that has ferny, bright green leaves. Foliage is topped by broad, creamy white flowers rising on stalks. A unique compact lavender with stunning foliage and dark violet flowers topped by lavender petal-like bracts. A tough perennial with a woody rhizome holding a basal rosette of 1 foot long triangle-shaped rounded leaves held on long petioles. Purple-white flowers rise above foliage on red stems. A showy perennial with tall stalks adorned with brilliant orange-red tubular flowers rising 1-3' above of a mostly basal clump of green foliage. A perennial with hundreds of one inch violet flowers on three foot spikes. A trailing shrub of aromatic, linear leaves with whorls of aromatic blue blooms appearing in from mid spring to early summer. An evergreen shrub with a small dense mounding habit spreading slowly outward from shoots from a spreading rootstock. Small, narrow gray-green leaves and dark blue flowers appear almost year-round. Compact, water efficient sage with dark red flower stems topped with dark violet-blue flowers. An outstanding small evergreen shrub for hot, sunny, low water gardens. Prolific flowers attract hummingbirds over along season. Cut back to a third in late winter every second or third year. A mounding shrub with two-toned flowers backed by very fine green foliage. The blooms appear continuously from summer until fall. A tender perennial of cool, silvery, woolly-felted leaves which provide excellent contrast in landscapes. Small, daisy-like, cream to yellow flowers rarely appear. Clump-forming agave with distinctive rosettes that form a long curving trunk flower. 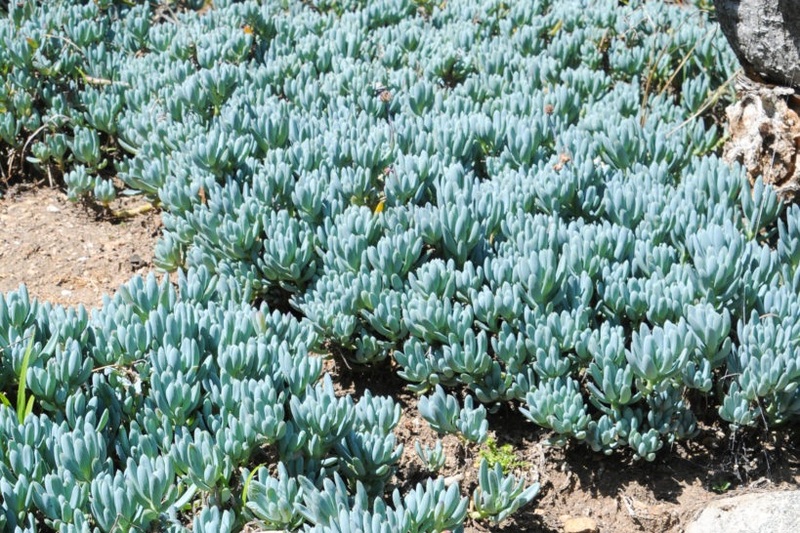 A compact rosette-forming succulent with broad, short, blue-gray leaves which have prominent reddish-brown teeth and terminal spines. 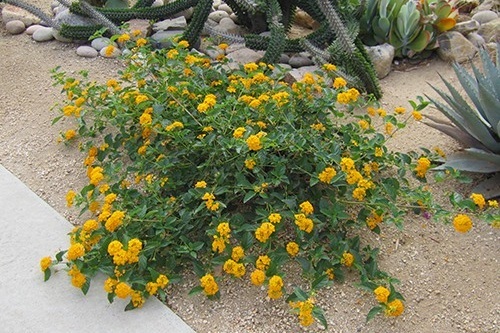 A fast-growing upright shrub or small tree with a long bloom of bright orange-yellow flowers on prickly branches clad with twice pinnate green leaves. Blood red, bottlebrush-like flower spikes cover this dwarf evergreen shrub from spring into summer. A densely branched habit with blue-green leaves that have a citrus scent when crushed. Summer prune to shape after flowering. 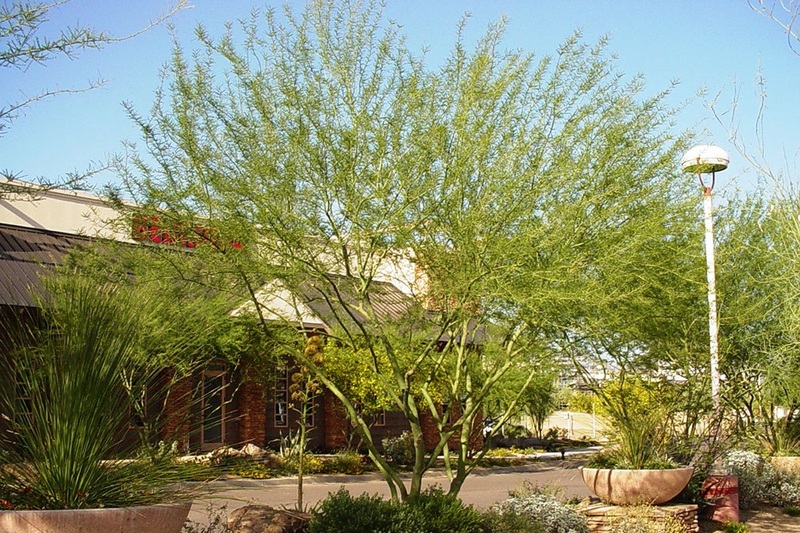 An upright shrub of green leaves with deeply incised margins creating thin feathery lobes. The bright yellow daisy flowers rise individually on long stalks from branch tips and flowers almost continuously with peak blooms winter into spring. An evergreen of graceful branches that cover a low, compact form with beautiful rose-red and white flowers emerging over a long blooming season. A compact silver leaf bush with small, tubular purple flowers. A woody-based perennial of the mint family with romatic, gray-green leaves on stiff, upright, square stems and whorls of tubular, light blue flowers. Unique whorls of butter-yellow flowers contrast with woolly, silver-grey leaves on a dense shrub-like form. Adds great texture and summer color to the landscape with minimal care. Prune back in late winter. Remove spent flowers to encourage repeat bloom. 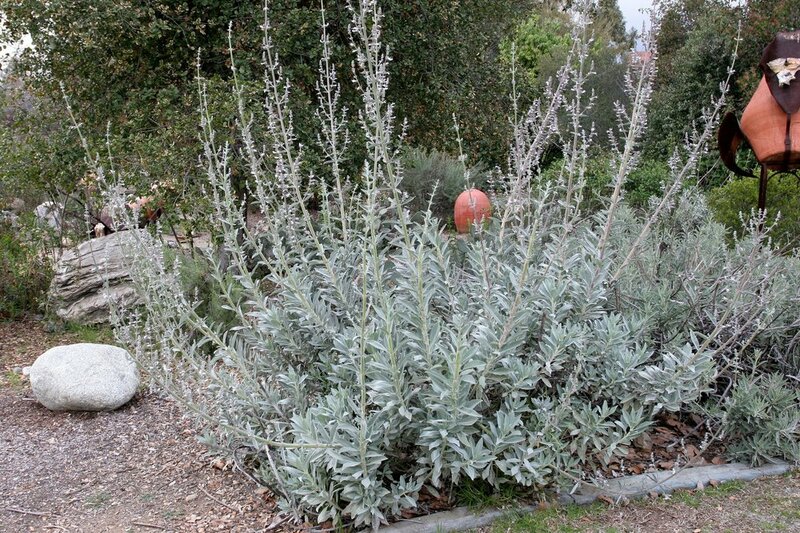 A sprawling shrub with upright stems bearing woolly, medium gray-green leaves and lavender flowers in whorls that rise just above the foliage throughout the year with a peak bloom in late spring. Quickly forms an upright hedge of aromatic, needle-like evergreen foliage with profuse clear blue flowers. A rounded, evergreen shrub with aromatic, needle-like, gray-green leaves and tiny, two-lipped, pale blue to white flowers. Clusters of scarlet tubular flowers resembling small recrackers provide reliable color from spring through fall. Slender, rush-like stems start out erect, then fall over into long, showy cascades. Prune in late winter or early spring. 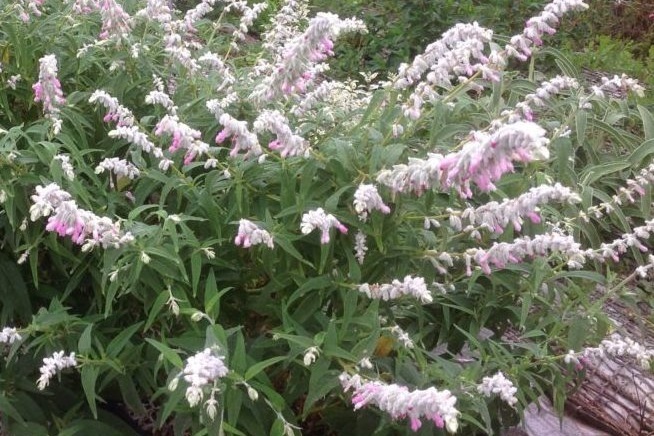 An evergreen aromatic salvia with soft, gray-white leaves on herbaceous stems. White, pale pink flowers form whorls along 3 foot stems in the spring and summer. 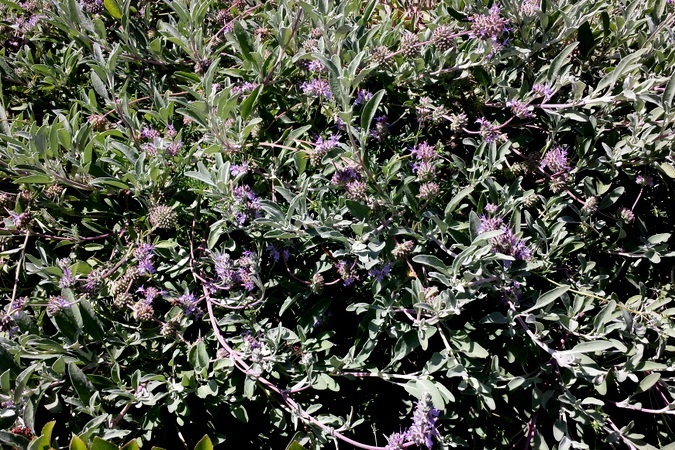 A native California shrub growing low to the ground with an extended bloom of whorls of lavender-blue flowers on long spikes from mid-spring into early summer, rising above the gray-green leaves. Quick growing shrub of upright stems covered with wooly white hairs, gray-green leaves and velvety white-pink flower spikes. Beautiful soft, gray-green foliage is a wonderful complement to the bright rich purple blooms. Prune lightly after the first flush to promote continued bloom. Hard prune annually to rejuvenate. Water deeply for the first few months, then reduce water. Evergreen shrub with white to light blue flowers from March to July. 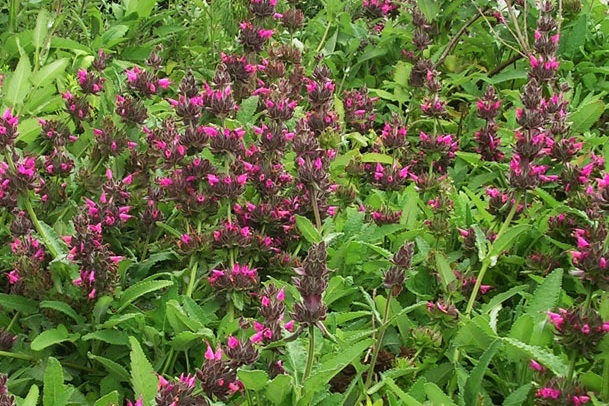 A low growing semi-evergreen herbaceous perennial sage spreading slowly by underground rhizomes. The plant is slightly sticky to the touch with pleasingly aromatic arrow-shaped light green leaves. Deep rose-pink flowers grow in large whorls on tall flower stalks from late winter into summer. 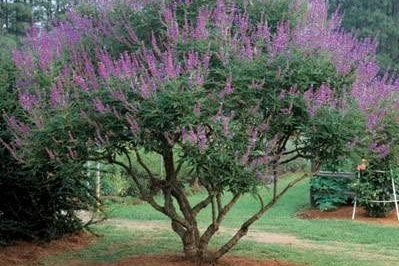 A fast growing upright dense-growing shrub with slender gray-green leaves and clusters of attractive mauve-pink flowers that are produced throughout the year. Carex divulsa is a perennial sedge that matures into finne textured arching clumps. The bright green foliage is evergreen. In late spring dainty bronze flower spikes are displayed above the leaves. For a neat appearance, remove old, faded foliage before new leaves emerge. 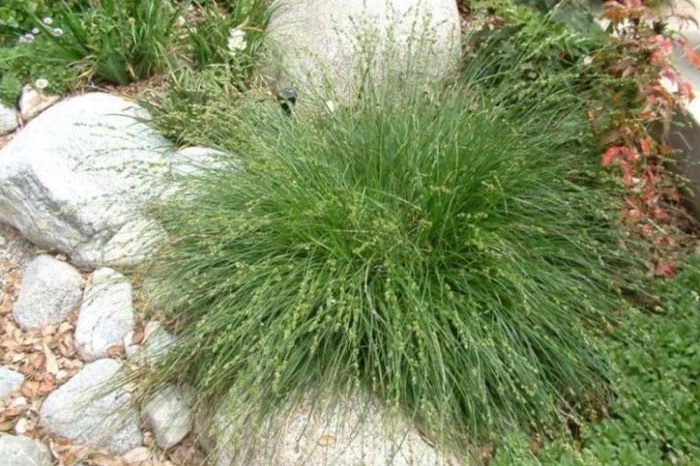 A short, rich-green sedge used as an alternative to turf grass. A good plant as a solid ground cover, between and around stepping stones or mixed with perennials and grasses to create a natural meadow look. Outstanding, icy blue coloration to this clumping ornamental grass holds up even through the heat of summer. Bu -colored owers create eye-catching contrast. Perfectly suited for edging borders or mass planting as a groundcover. Remove old, faded foliage before new leaves emerge. 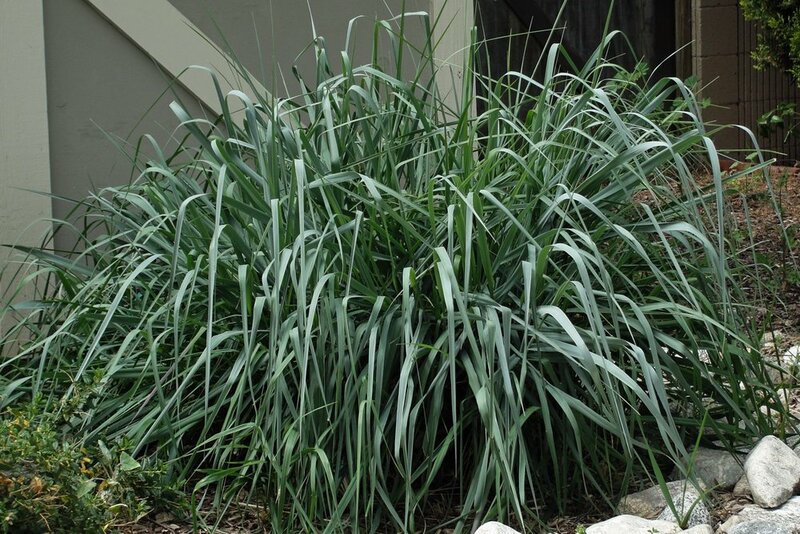 Sturdy, water efficient grass with green foliage when new, maturing to brilliant silvery blue. Its relatively small size, glossy green foliage and airy pink-red owers set this extraordinary selection apart from others. Especially attractive when planted in masses where plumes can be back-lit by the sun. For a neat appearance, hard prune old foliage annually, before new leaves emerge. Warm season bunch grass with narrow leaves and long silver-gray flower panicles that arch gracefully 2 to 3 feet over the gray-green foliage in late summer. One of the best low-growing ceanothus for use as a large-scale groundcover. Glossy, dark green leaves with a refined look give it a truly handsome appearance. Deep blue owers form one-inch clusters. Fertilize in early spring. Space 5 feet apart as groundcover, or closer for faster coverage. Brilliant golden yellow flower clusters cover this colorful, heat-loving perennial from spring to fall. Trailing growth is excellent for use as groundcover or tumbling from hanging baskets. Control weeds with mulch until plants ll in. Prune back in Spring. Profuse color nearly year-round from masses of vivid orange-red flowers. An excellent low border, groundcover, or accent shrub. Tolerates heat. Control weeds with mulch until plants ll in. Prune back in Spring. Bushy perennial that branches from the base with reddish stems bearing narrow, long green leaves and yellow-red flowers. A dwarf, rounded shrub of dense, compact growth and glossy evergreen foliage. Occasionally produces small orange blossom-scented flowers. A small, low growing succulent, branching from the base and rooting along the stems to provide an easy care, attractive ground cover for warm sunny hillsides and yards. Powdery blue-green fleshy leaves provide year round interest. A semi-evergreen plant that forms a dense mat with tiny deep green leaves perfect for groundcover between stepping stones or rocks or spilling over a wall. Large yellow blossoms give a dazzling display of color in the spring. May rebloom in summer if given supplemental water. Aer the foliage falls, the trunk and stems remain green, providing year-round interest. Water regularly and deeply during the first growing season to establish an extensive root system. A deciduous shrub to small tree with magenta flowers that occur in spring. Rounded apple green heart-shaped leaves emerge, aging to blue-green. An open, airy structure distinguishes this small tree. The willowy pendant branches display long, narrow leaves highlighted by fragrant, trumpet trumpetshaped, burgundy-pink flowers that will draw hummingbirds into the garden. Water deeply, regularly during first growing season to establish an extensive root system. Once established, reduce frequency. A small deciduous tree that produces a profusion of crepe-like fiery red flower clusters. The bright green summer foliage develops exquisite orange-red coloring in the fall. Smooth, mottled, light cinnamon brown bark adds year-round interest. Remove suckers from the base of older trees. 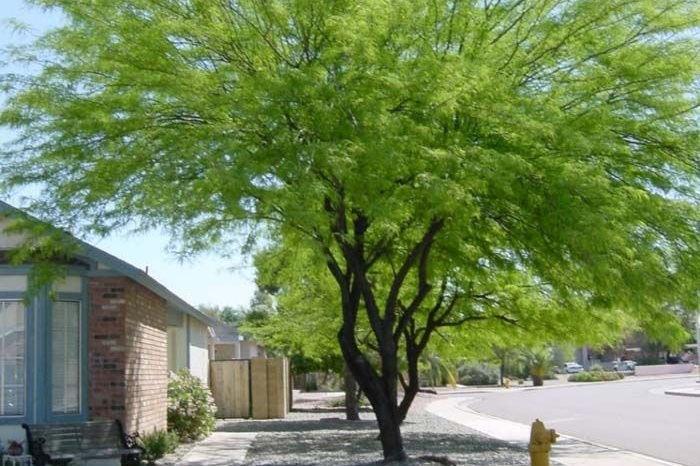 A rapidly growing tree with trunk, branches, and leaves gray-green in color with bright yellow flowers that attract pollinators. A water efficient, semi-evergreen tree with an open, airy, crown. Refined foliage and stems have a purple cast when young. A water efficient, evergreen tree of open-grown and broad crowns with foliage often reaching the ground. An deciduous shrub/tree with aromatic, compound, grayish-green leaves with tiny, fragrant, lavender to pale violet flowers appearing in mid to late summer. Flowers are quite attractive to butterflies. EcoTech Services administers the Plant Voucher Program on behalf of Upper San Gabriel Valley Municipal Water District. Please contact EcoTech if you have any questions regarding participation guidelines, application process, voucher status, or any other general Program questions.